KNRUHS PG Medical Courses Admissions 2019, KNRUHS PG Medical Degree/Diploma & MDS Courses Admissions 2019: Kaloji Narayana Rao University of Health Sciences Telangana has given the PG Medical Degree/Diploma and MDS Course Admission notification 2019-2019 and application forms through online are invited for admission into the following courses for the academic year 2019-19 into affiliated colleges to KNR University of Health Sciences, Warangal and NIZAM's Institute of Medical Sciences, (NIMS) Hyderabad in the state of Telangana from the eligible candidates who have secured the following cut-off scores in NEET PG 2019, NEET MDS 2019 for preparation of State Merit list. Notification issued is for determining State Merit position for admission into Competent Authority Quota seats only. Total number of seats available under competent authority quota for the academic year 2019-18 will be notified later. Fee structure will be as fixed by the Government. 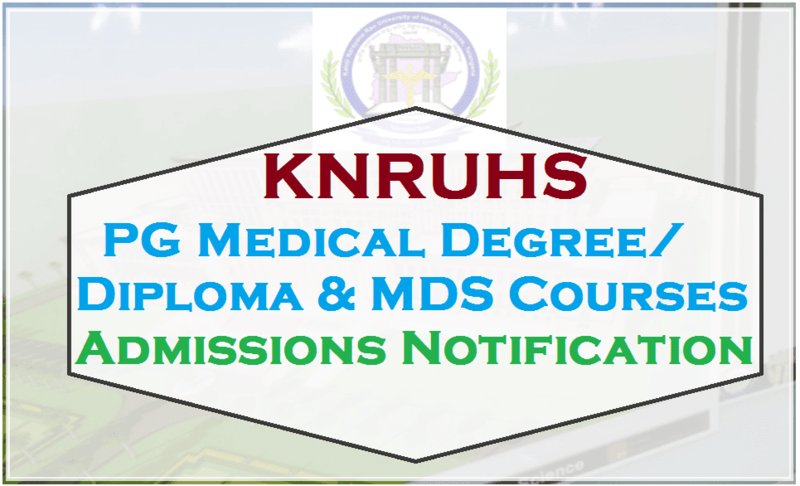 Cut-off marks for Post Graduate Medical Degree/Diploma courses: (A) for MDS courses: see in notification. State Merit position of the applied candidates will be prepared based on NEET PG 2019 score and other eligibility criteria notified here under(see in notification). Telangana Health university invites applications: Kaloji Narayana Rao University of Health Sciences has invited applications for admissions to Post Graduate Medical Degree/Diploma and MDS courses. Aspirants who have qualified through NEET PG and NEET MDS and fulfill eligibility criteria for preparation of state merit list can apply online. For more details visit www.knruhs.in and http://tspgmed.tsche.in. certificate. The candidates those who will be completing internship by 15-04-2019 shall submit provisional internship completion at the time of verification of certificates. http://tspgmed.tsche.in for PG Medical and http://tsmds.tsche.in for PG Dental courses from 11.00 AM on 11-04-2019 to 17-04-2019 upto 5.00 p.m only. The online application can be filled through any computer with internet connection (home/internet café/net center). The printout of filled-in application along with enclosures in two (2) sets should submit at the time of verification of original certificates as per the notified schedule and centers by KNR University of Health Sciences. 2. Availability of online Application http://tspgmed.tsche.in/ :: 10 A.M. on 23-03-2019 to 28-03-2019 up to 5 P.M. Address to which the Print out of application along with enclosures to be sent. :: 2 Copies of print-out of application along with all enclosures to be submitted at the time of attending verification of Original Certificates to the camp officer to get eligibility to attend counseling. (a) Admit card and Score Card – NEET – PG 2019 . (c) Date of Birth Certificate. (SSC or its equivalent certificate) (d) Study Certificate(s) from 1st MBBS to final MBBS. Study certificates from 6th class to Intermediate / 12th standard. (f) In case of candidates from Christian Medical College (CMC), Dichpalli study certificates from 6th class to Intermediate / 12th standard and study certificates from 1st MBBS to final MBBS. (g) In case of candidates obtained MBBS or equivalent Degree from outside the State of Telangana and Andhra Pradesh / India, 10 years residence certificate of father / mother /spouse issued by Competent Authority indicating years of residence and other relevant certificates if any as per Presidential order in support of eligibility. (h) All marks memos from 1st MBBS to final MBBS. (i) Category/Minority status certificate if applicable. (j) Service certificate if applicable. (k) Internship completion certificate / Provisional Internship completion vide Annexure-IV C of prospectus. (c) Date of Birth Certificate. (SSC or its equivalent certificate) (d) Study Certificates from 1st BDS to final BDS. outside the State of Telangana and Andhra Pradesh / India, 10 years residence certificate of father/mother/spouse issued by Competent Authority indicating years of residence and other relevant certificates if any as per Presidential order in support of eligibility. (g) All marks memos from 1st BDS to final BDS. (i) Internship completion certificate / Provisional Internship completion vide Annexure-IV of prospectus. (k) Differently abled (PH) certificate if applicable. 5. Visit website through internet Explorer (7.0 to 9.0) or Mozilla Firefox (14 to 25) or Google Chrome (20 to 31) to fill in the application form. Procedure for submission of filled-in online Application form for PG Medical Degree/Diploma & MDS Degree courses:-The candidate should submit the print-out of the filled-in Online application form in person along with two (2) sets of self attested copies of required certificates at the time of certificate verification at notified centers. without copies of the required Certificates, Passport size photo, without signature at declaration area, incomplete applications will be automatically rejected and will not be considered for determining the Merit position in respective categories using NEET – PG/NEET MDS – 2019 score. for admission to PG and MDS courses 2019 session will be examined by the University only after submission of printout of application (hard copy) along with all copies of required certificates at the notified centers for verification of original certificates on specified dates. 4. Verification of Original Certificates shall be conducted on specified dates at the centers notified by the University candidate should attend in person without fail with Original Certificates and self attested copies. The verification of Original certificates will be done only once irrespective of the number of times of exercising web options. Therefore the candidates should attend verification of Original Certificates without fail as and when notified. Admissions to Post Graduate Medical and Dental Courses shall be applicable. 6. This notification is for determining the State Merit position in respective categories using NEET – PG/NEET MDS – 2019 score only. The dates for exercising web options for admission to PG (MD/MS) and MDS courses and procedure will be notified separately on University website. Candidates are advised to referred to University for notifications, schedules and other details from time to time. above cutoff score in NEET- PG and NEET MDS – 2019 test and based on the state merit order as the case may be.